Join the Health Care Council as we welcome Assemblymember Adrin Nazarian, chair of the Aging and Long-Term Care Committee as well as a member of the Health Committee. With new political leadership and a changing policy landscape, it is important for our Health Care Council to have clear policy goals. We'll be adopting the 2019 advocacy agenda, which charts the direction of the advocacy work we will be engaging in for the year. 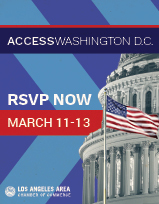 Your input is also needed as we structure the 2019 ACCESS Washington, D.C. advocacy agenda for the trip in March. Diving into statewide policy, please bring any bills or issues that your organization has identified thus far that the Chamber should engage on. We'll be reviewing the governor's announcements and discuss our response. We will also introduce a new co-chair to our council, Noah Traisman, director of informatics & strategic initiatives for Quest Diagnostics.